Traditional chemistry is immensely powerful when it comes to producing very diverse and very complex microscopic chemical molecules. But one thing out of reach is the synthesis of large structures up to the macroscopic scale, which would require tremendous amounts of chemicals as well as an elaborate and complicated technique. For this purpose, scientists rely instead on “self-assembling” molecules, compounds that can interact with other copies of themselves to spontaneously congregate into spheres, tubes or other desired shapes. 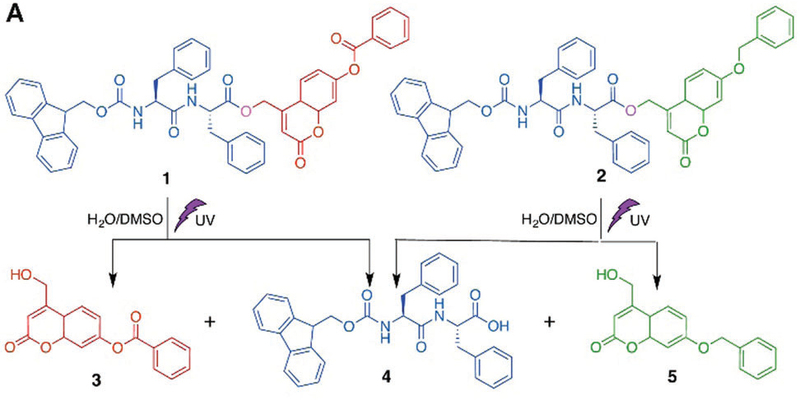 Using this approach, researchers at the Okinawa Institute of Science and Technology Graduate University (OIST) now reports in Chemical Communications new self-assembling molecules that can transform into novel, exotic and previously unobserved shapes by simply using UV light to force them to rearrange differently into “metastable” states. When designing self-assembly structures, scientists typically aim for the state of lowest energy – or “ground state,” in which the structure would be at its highest stability. Less stable shapes are usually dismissed as incorrect and undesirable. However, this “ground state” being very stable makes it arduous to break down the structure if you wish to alter its shape. In this research, OIST scientists inserted a weakness into their ground-state self-assembled structures, resulting in structures requiring only a small nudge to collapse. In this case, the nudge is the use of ultraviolet light to snip a specific bond between two atoms within the molecule, splitting the structure into smaller fragments. The fragments are then able to co-assemble into less stable – called metastable - but novel and exotic shapes. Molecules 1 and 2 can self-assemble separately into nanostructures. The exposure to UV light will disrupt these nanostructures by splitting 1 into shorter fragments 3 and 4, and splitting 2 into 4 and 5. The new mixture of shorter fragments can spontaneously recombine into novel shapes. This new concept led to a fascinating discovery: because the remaining fragments are tightly packed following the collapse from the initial structure, they can form novel and exotic structures which are not attainable if you just mix the same molecules in free motion. Imagine these nanostructures made from Lego bricks: initially you have 2x5 bricks - 2 studs wide and 5 studs long – self-assembling into a nanofiber. Ultraviolet light will split these 2x5 bricks into two smaller pieces, for example a 2x3 brick and a 2x2 brick, destroying the entire fiber-like structure. But because these smaller bricks remain pre-organized spatially staying close to each other, they can easily recombine themselves into new shapes visible with the naked eye. In contrast, if in a separate experiment you just mix 2x3 and 2x2 Lego bricks in a random manner in a bucket with varying distances between bricks, their lack of spatial organization prevents the assembly of such novel nanostructures. Yellow-arrowed path from 1 to 3: An initial fiber-like structure is created (1), then broken down using UV light (purple lighting symbol). Because they are tightly packed in the aftermath of the collapsing structure (2), these fragments co-assemble again into more diverse and larger shapes (3). Gray-arrowed path from 4 to 5: Simply mixing the same molecules in free motion in a solvent (4) do not result in the same variety and size of nanostructures (5). The present research performed at OIST strongly suggests the initial conditions are the most critical parameter influencing the final shape taken by self-assembling molecules. “If you know how the molecules pack with each other from the parameters of the initial state, then it will give you more clues to aim towards a specific macroscopic shape,” commented Prof. Zhang. In pharmaceutical design, such a concept would allow a drug to reach its target in a living organism – an organ or a tumor – in an inactive state, thus limiting potential side effects. Once broken down in this targeted location, the drug would reshape itself into a different structure with therapeutic activity.